DMYL Attorney Steve Itkin elected as new Vice President of Foundation for Creative Broadcasting, Inc.
Attorney Steve Itkin has been recently elected to serve as Vice President for the Foundation for Creative Broadcasting, Inc.. He has been a long time supporter and volunteer of the organization and will continue volunteer on the board in this new role. 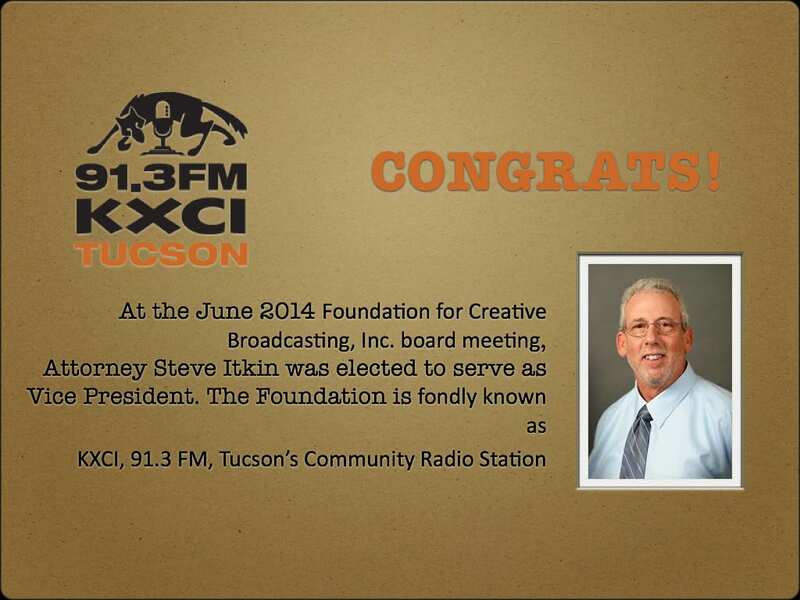 The Foundation for Creative Broadcasting,Inc., is responsible for Tucson’s only local community radio station, KXCI, 91.3FM. 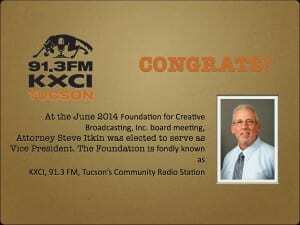 KXCI is an award-winning, non-profit and independent, community-based radio station located in the historic Armory Park in downtown Tucson, Arizona. KXCI has been broadcasting local and independent music in a terrestrial radio format since 1983. Steve Itkin demonstrates the DMYL philosophy of community stewardship by volunteering his time and talents to various professional and community organizations such as Arizona Creditor Bar Association, Inc., Arizona Trustee Association, Big Brothers & Big Sisters of Tucson and The Tucson Organic Gardeners.